HOLLYWOOD (NEA) — The underground movie — or “non-commercial cinema,” as those who make them prefer to call their product — is blooming. Most major cities have theaters showing these avant-garde films. There are dozens of festivals at which they are shown. And you wanted to see “Camelot”? 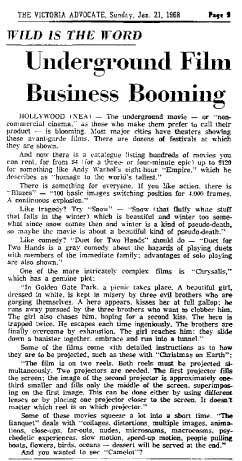 Underground Film Journal notes: The condescending tone of this article is in stark contrast to the similarly-themed yet upbeat article from the Feb. 5, 1966 Pocono Record by Charlotte Roberts. Most likely, the anonymous author of the above article was copying from the Film-maker’s Cooperative Catalog — several of the films written about are still listed with the Coop with the same descriptions. But, the most condescending thing this author did was not to mention filmmaker names with the titles, as if who made these films were totally unimportant, with the exception of dropping Andy Warhol’s name because, it can be assumed, Warhol’s name could sell newspapers in 1968. As for the films mentioned above, Blazes is, of course animator Robert Breer’s breakthrough and legendary experimental animated film. Blazes is still listed in the Coop’s online catalog with the same description used above. The same goes for Snow, a 1965 short film by Shirley Erbacher, a filmmaker whose name the Journal is unfamiliar with at this time. Duet for Two Hands is unfortunately no longer listed with the Coop, and neither is The Banquet. So, the Journal does not know who made those. If you happen to do, please leave a comment below. Chrysalis, which is named in the article, is most likely not the Ed Emshwiller film of the same name, since that has a completion date of 1973 and the article was published in 1968. Is there an earlier version of Chrysalis that Emshwiller did? Again, if you know, please leave a comment below. Lastly, Christmas on Earth is the classic multiple-projection film by Barbara Rubin. For everyone who thinks the above list of films sounds like a wonderful way to spend an evening, this article reprint is dedicated to you.